With interplanetary build quality and universal disc playback, the UDP-LX800 blows Steve May away. 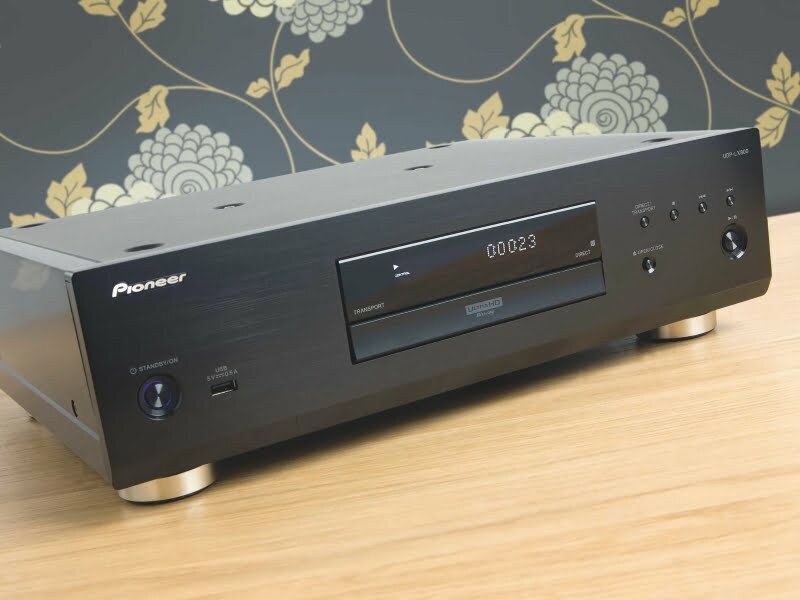 Read our PIONEER UDP-LX800 Review. 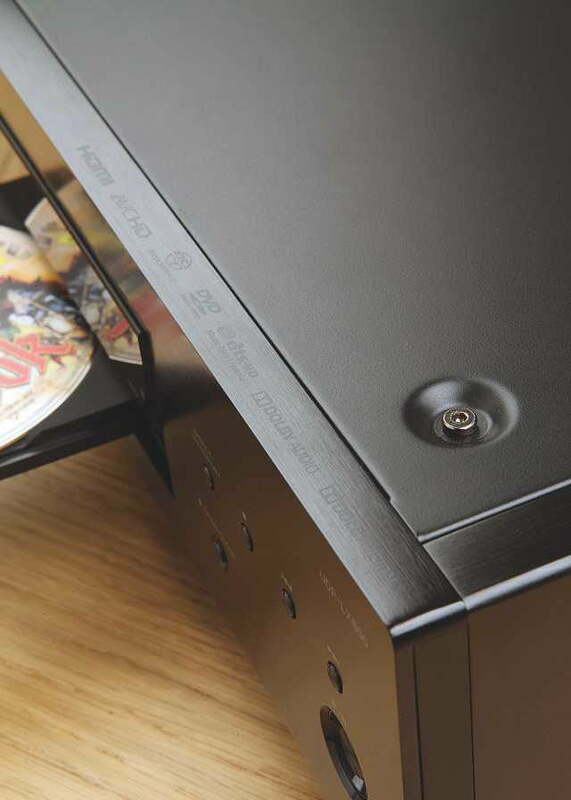 The Pioneer UDP-LX800 is to Blu-ray players what the Ark of the Covenant is to flatpack furniture; an imposing, grandiose, over-engineered behemoth boasting leading-edge video processing and audiophile musical chops. Fully universal, it spins UHD Blu-rays and assorted derivatives, plus SACD and DVD-Audio discs, as well as regular CD platters. It’s the higher-end stablemate to Pioneer’s UDP-LX500, a model that is similarly substantial, but doesn’t quite match it for refinement. If you’re after the ultimate in no-compromise disc spinners, then the UDP-LX800 is it. Formidable springs to mind when it comes to build quality. The deck’s construction, with 1.6mm steel-sheet chassis and noise-deadening aluminium side panels, even eclipses Panasonic’s premium DP-UB9000 [see HCC #292]. At 13.8kg, it’s weightier than many AVRs. Anchoring the flagship are four large isolating feet with rubber anti-slip pads. USB port; Ethernet; RS-232C; and dedicated stereo phonos bolstered by a balanced stereo output for use with a compatible pre-amp. There’s no multichannel audio bank, however, which might surprise you. A second USB port is found on the front. Wi-Fi is integrated. The £ asking price gets you plenty of attention to detail under the bonnet. A complex six-layered circuit board has been engineered for minimum noise, in order to do justice to the high-speed signal transmission capability of UHD discs. A three-block layout separates power supply, digital processing and analogue audio; a tried and tested way to combat electromagnetic interference. The analogue audio circuit itself has a dedicated ‘quick-response’ power transformer with custom-made capacitors. Pioneer engineers have even embossed the casework of the power transformer and power supply circuit, says the brand, to help combat standing waves within the player. In short, this is as painstakingly built a Blu-ray deck as you could hope to find. Unfortunately, if there was a prize for UI design, this machine definitely wouldn’t win. The home screen is dour and boring, offering just source selection and settings. The source selector isn’t just for physical media. It’ll also locate suitable media servers when online. Audio file compatibility is extensive, covering MP3, WMA, ALAC, AIFF, WAV and FLAC up to 24-bit/192kHz, and DSD 2.8MHz and 5.6MHz. There’s no native MQA support, but as Pioneer has been rolling out firmware to its network kit, we live in hope. While the main menu is almost apologetically simplistic, there is customisation and tuning available. The player offers a quartet of picture presets (Reference, OLED, LCD and Projector) to optimise the HDMI output for display types, with auto detection of SDR and HDR – the UDP- LX800 supports Dolby Vision, as well as regular HDR10. There’s no love for HDR10+, however. Display settings cover everything from 480p to source direct. In addition to colour subsampling (variable between 4:4:4, 4:2:2 and 4:2:0), the UDP-LX800 can interpolate native 8-bit discs to 10- or 12-bit depth. Unless you know what you’re display supports, it’s probably best to leave the player in Auto mode (a rule of thumb that solves many problems). Much like the Oppo models it usurps, there’s no streaming content provision. While this is hardly a deal- breaker for products of this calibre, it looks a little bereft without some VOD provision, particularly when compared to the Panasonic DP-UB9000 (which adds HDR10+ to the feature roster, too). Of course, there are other ways to amuse yourself with the UDP-LX800 besides bingeing on Better Call Saul. The display information screen is a source of continual fascination, not least because you can use it to read HDR10 metadata to reveal the Maximum Frame-Average Light (MaxFALL) and Maximum Content Light Level (MaxCLL) of 4K discs. This trick lifts the veil on disc mastering, giving a clear indication just how much effort your screen will need to put into tone-mapping HDR content (the surprising answer, in my experience so far, is not that much). Yet this deep playback info is accessed only by holding the Display button on the remote down for an extended period – it’s a bit of an Easter egg approach for something so compelling. With regular Blu-rays, the same info screen shows basics such as resolution, frame-rate, colour space and colour depth, as well as the audio format and a live bitrate meter. Image quality with 4K UHD discs is drop-dead gorgeous. Calling up the same titles used to audition Panasonic’s DP-UB9000, I was taken aback by the solidity and dimensional realism of its pictures. Pacific Rim: Uprising (Ultra HD Blu-ray) is a feast for the eyes, combining precise Dolby Vision HDR with flawless skin texture and ravishing, nuanced colour. The player eagerly rewards owners of high-grade displays (I auditioned it primarily with a Sony AF9 OLED). Despicable Me 2, another Dolby Vision encode, exhibits sumptuous colour rendering, with tight highlights and crisp detail. The deck puts everything on screen, without noise and artefacts. Standard Blu-ray performance, with upscaling handled by the UDP-LX800, is equally outstanding, with fine, unfettered detail and smooth hues. It’s a matter of conjecture whether the UDP-LX800 is comparable to, or better than, its Panasonic rival when it comes to image quality. Both offer pristine detail. Under the microscope, differences between the two players become slightly more apparent, though. A magnified snapshot of a 4K zone plate chroma frequency response test reveals a stepped edge to ultra-fine, curved edges on the big Pioneer. The same content on the Panasonic has no such coarse stepping, and is smoother as a result. But this is a semantic difference. When it comes to what’s seen onscreen, both are five-star performers. It’s sonically where the UDP-LX800 really stands out. This player is second to none, with a character that’s refined, musical and detailed. Its audio design owes much to Pioneer’s PD-70AE SACD/CD player. The two decks share an identical PCB stereo signal path (if it ain’t broke…) and component layout, not to mention the same 32-bit, Parallel Drive ESS ES9026 PRO Sabre DACs. Ditto for SACD playback. Spinning saxophonist Tommy Smith’s modern jazz outing Blue Smith (Linn Records) is probably the next best thing to being in the recording studio for a live session. The soundstage has tangible girth, and resolution in reserve. When using HDMI, there’s a Transport function to cut the power supply to the analogue audio transformer circuit; with only the digital circuitry powered, there’s a claimed benefit in HDMI signal-to-noise ratio. Pioneer has produced something uniquely special with the UDP-LX800. This BD beast sets a new standard for build quality and AV performance, combining peerless video replay with sensational sound quality. In fact, I’d argue no UHD player comes close to the UDP-LX800 in terms of musical performance, and that includes the Oppo UDP-205. This is unquestionably an audiophile- grade component. The only shortfall, at least in comparison with its more affordable rival, the Panasonic DP-UB9000, is the lack of HDR10+ support and streaming media apps. But are either an issue, given that only a few displays support the HDR10+ standard, and streaming services are pretty much ubiquitous on other devices? That’s for you to decide. This reference-grade UHD flagship player currently has no equal. Offering superb video performance and universal audio support, it's sensational. Match the Pioneer UDP-LX800 to Sony’s equally high-end (and high-style) Dolby Vision-enabled 4K OLED TV. A 55in version sells for around £; for a more immersive experience, opt for the larger 65in set.